According to Small Business Trends, 44% of local businesses said that they were dependent on social media to generate brand awareness with 41% relying on it to drive revenue. But having an online presence and posting across Twitter, Instagram, Facebook, YouTube and LinkedIn is no longer adequate. Facebook announced that users will “see less public content like posts from businesses, brands and media.” With organic reach in decline, the only way to get visibility in front of social media users is through social media advertising. 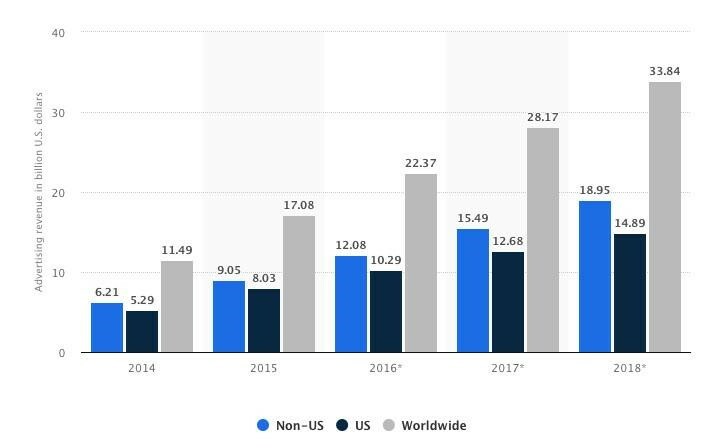 In the following chart, it is clear to see that brands are investing more into Facebook advertising. For example, in 2018 alone, Facebook reported USD $33.8B revenue from its advertising platform, tripling the global revenue it reported back in 2014. While it may be difficult to communicate the value proposition of a service business compared to a physical product, the secret to marketing a service business is to focus on the benefits rather than on the features. For example, a rookie marketing mistake that a criminal law firm could make is to spend too much time talking about their staff. The savvy marketer, however, will understand the customer journey and craft a message that offers a solution to the user. 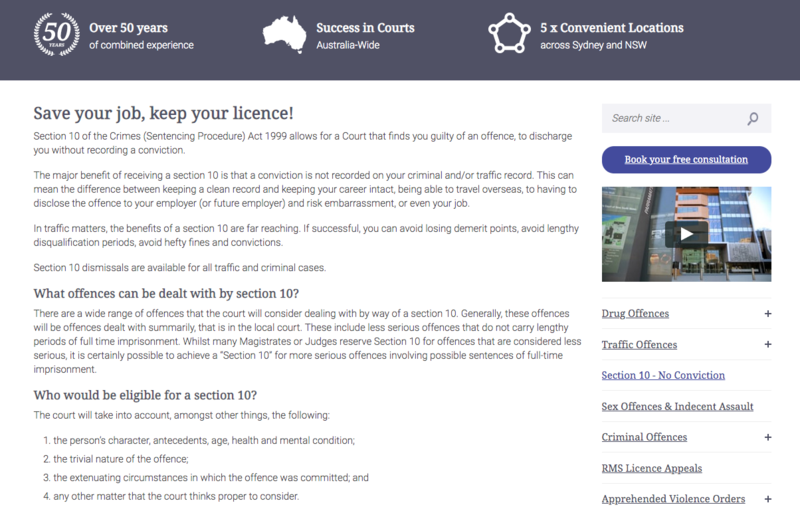 See how strong the call-to-action header is positioned on LY Lawyer’s website? Similarly, how can a physiotherapy clinic communicate the benefit of their service rather than describing what they do? Most consumers are already aware of what a physiotherapist (plus this information is readily available on the internet). Therefore, any marketing message for health-related service businesses should focus on how the service can solve a problem. Bend + Mend, a physiotherapy and pilates clinic does this well on their website. But copy-writing a website landing page is very different to crafting marketing messages on social media – especially for paid campaigns. This is because when a user visits a landing page, they are typically already looking for your service. However, when it comes to social media advertising, interruption marketing requires an entirely different approach. Each social media platform makes it very easy to create an ad and have it running within minutes. Given that Short of taking up a Diploma of Social Media Marketing, or watching countless YouTube videos by self-appointed gurus, we’re sharing a few surefire tips to help you maximize your social media advertising ROI. Up first is, of course, to have a well-formed strategy in place. You’ll want to make sure that all of your social media advertising movements are cohesive and working towards a final goal, rather than being completely random. In doing this, you’ll be able to set multiple social media advertising campaigns in place across a wide variety of platforms and then monitor and analyse them against your goal. A few essential components to your strategy should include an audit of existing advertising, the overall goal you’d like to achieve, your budget and finally the types of advertising solutions you’d like to utilize. Most social media platforms have a variety of different advertising options, so be sure to choose those best suited to meet your goals. As a service business, you won’t really have anything too tangible to sell to your customers and this is where imagery and media come into play. Develop media assets that effectively display the outcome of your services, or create some easily consumable videos or images that convey exactly how your services work. Take advantage of YouTube ads, or Facebook and Instagram’s video advertising portals for this step as these are going to be the best advertising spaces for you. Through data-driven ad placements on these platforms, you’ll be able to choose exactly who sees your video media and be able to come closer to checking off the goals in your strategy. To make video creation a little easier, there are platforms online like Wave Video that take the hard work out of filming and editing. This tip is reserved more so for those service businesses who are entirely online and can work from anywhere – unless you can find a localized influencer. Spend some time digging through platforms like YouTube and Instagram to find an influencer who has content and an audience that matches your target market. If you’re a graphic designer, sift through the creators who have ‘How-to’ or other graphic design videos because their audiences are likely going to be interested in the services you offer. Then have the influencer direct their audience to a specialized link you’ve created for the promotion. If you’ve never tried influencer marketing before, all you’ll need to do is find the creator’s email address in their blog bio or description box on YouTube and reach out to them. They’ll let you know their fee and commission information and you’ll be able to move on from there. A rather simple tip is to create social-media-only promotions. These are the types of promotions you won’t need to list on your website, but rather have your social followers click a custom link that directs them to a private promotion page that can’t be found on your website. This way you’re encouraging click-throughs to your service pages and enticing customers more effectively by providing them with a reason to continue following you – savings and deals. A big part of this tip, however, is to ensure you have web pages developed that are going to convert well. You shouldn’t link a promotional ad to a generic page on your website or users will be confused about why it was listed as a promotion. Lastly, all of your social media advertising activities should be connected together by similar visuals, videos and language use. You should ensure all of your social media accounts have the same profile photo, color use as well as similar imagery – this is called integrated marketing. Our best example of this is Apple. If you take a look at Apple’s website and all of their social media ads, there’s no mistaking that you’re looking at an official Apple post. Work on copying this cohesiveness in your own social media advertising and you’ll be able to ensure none of your target customers are confused when they visit any of your accounts. Daniel writes for Shotkit - an online resource for photographers to learn, be inspired, and grow their business. He has a special interest in digital marketing since he runs his own business as a wedding photography and video agency and has poured thousands of dollars of his own money into social media advertising.